WhiskyIntelligence.com » 2013 » February - whisky industry press releases, newsletters, events, tasting notes, bottlings and comments. Whisky Wednesday reviews a Lady Of The Glen bottling of Invergordon 24 Year Old Single Cask Grain Whisky. Jameson has launched the next instalment of its award-winning* advertising campaign, Legendary Tales of John Jameson, with a new TV commercial which aired for the first time in the USA this week. The creative – entitled Iron Horse – was directed by internationally acclaimed director, John Hillcoat, whose recent film work includes Prohibition era drama, Lawless and created by advertising agency, TBWA Worldwide. The commercial continues the saga of the brand’s founder, John Jameson, and his quest to protect his whiskey. In this action-packed commercial, Jameson comes face-to-face with his fiercest adversary yet – modern technology – and manages to rescue a runaway train carrying a cargo of his precious whiskey. Available in both 30 and 60 second spots, the commercial premiered during the NBA All Stars game on 17th February and from the 25th February, the full national TV and digital flight kicks off for three-weeks. The Balvenie Tun 1401 Batch 5 is now available to order – Stock is very limited so order online today to avoid disappointment. The Balvenie Tun 1401 Batch 5, is married from nine casks of the distillery’s characteristic spirit. Selected from five traditional whisky casks & four sherry butts from Warehouse 24, the contents were transferred into the impressive Tun 1401 – a traditional oak marrying vessel cared for by the distillery’s onsite team of coopers. Upon pouring, a fragrant fruit nose before sweet vanilla emerges alongside honey & spices. A smooth balance between sweetness & oak tannin, underpinning a sherried character full of dried fruits, cinnamon & ginger spiciness. Rich, sweet and spicy. Bottled at 50.1% volume. Only 900 bottles available in the UK. Limited stock available to order. Mark Dermul, Belgian whisky blogger, launches a mini-series of 5 videos in which he explores independent bottlings of Auchentoshan. In this second video, he explores the Auchentoshan 8 Year Old from La Maison du Whisky’s series The Ten. Enjoy this Light Lowland! We’re delighted to let you all know that, based on multiple requests and growing popularity of Isle of Skye 8 YR, we have added 1.75 liter size to the line. We’re confident this addition will add more value to the brand and will lead you to the sales increase. Please see attached the image. The RRP is $ 59.99. The Scotch Malt Whisky Society, The Vaults, 87 Giles Street, Leith EH6 6BZ Contact: sales@smws.com or call 0131 555 2929 (Mon-Fri 9am-4.45pm). Talisker™, the famous Single Malt Scotch Whisky from the Isle of Skye, is to have a new family member. TALISKER STORM™ is an exuberant new expression of Talisker, calculated to delight and intrigue the many adorers of this celebrated island whisky: more intense and smoky, with enhanced and vibrant maritime notes, smoothly balanced with Talisker’s signature hot sweetness. It will be available early 2013 through domestic retail channels and whisky specialists in selected European markets. Full gold in appearance, and assembled by Diageo’s master blenders from both rejuvenated and refill casks at different ages to deliver a perfect balance of vibrant distillery character and smoother woody richness, it is bottled at the traditional Talisker strength of 45.8% ABV, without an age statement. Further exciting new expressions of Talisker will be launched later in 2013. 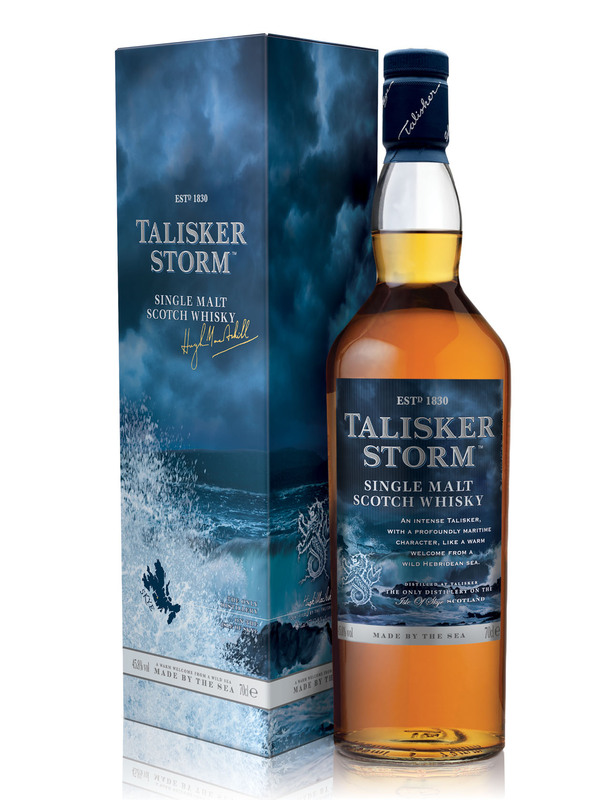 TALISKER STORM™ Full tasting notes read: Appearance: Full gold. Nose: At first restrained yet spicy, with a hint of struck matches; fresh-clean and growing in complexity like a gathering storm to reveal a honeyed sweet maltiness with ripe red berry fruit. Eventually a little well integrated mellow smoke drifts across the scene as a wild sea turns up briny, fresh clean notes, and an oily explosion of pepper. Body: Medium. Palate: At first sweetly mellow and rich in the mouth then quickly very spicy and increasingly stormy as the Talisker heat comes through. It’s as if the pure, tongue-coating sweetness joins hands with a deep nutty smokiness to embrace those spicier notes. The flavour is elegantly drawn out with a good balance between sweetness, smoke and salt, which is all the more evident when a little water is added. Finish: Clean and of medium length, warming, with a lasting, smooth aftertaste, in which late peaty burnt embers can be found. Whisky Tastings, Whisky Festival, Whisky Sale! Peter Mackay is a 2nd generation family member of the organisation that runs the Scottish Liqueur Centre in Perth. They independently age single malt whiskies under the Càrn Mòr label. Nickolls and Perks were lucky to receive slim stocks of these irreproachable malts into their Stourbridge store in late 2012 and now very much look forward to showcasing this unique selection for you. How does an independent bottler go about choosing casks ? Find out the answer to this question and taste the rare drams on 21st March with Peter Mackay in our tasting cellars here at the shop. NB : Saturday 13th April is the NEXT Midlands Whisky Festival -200 whiskies, Dream Drams, Masterclasses, discount vouchers and more! And finally, check out the N&P Whisky Sale – ends 28th February! Genuine savings – 15% off! Today is my first day back in the office and what a drive it was (see the pictures below). I had better head home soon! PS – thanks Ian for braving the weather and taking these pictures – the next dram is on me! My friends in our marketing team have been working on a series of videos dedicated to Grant’s. You can see the first below with Gregor, our mixologist, demonstrating how to make the perfect Grant’s Manhattan whisky cocktail. I thought you might want to know that new videos of Gregor, our cocktail mixologist, have been posted on our YouTube channel. Grant’s Whisky is now on Twitter! Did you know that you can now follow Grant’s on Twitter? For all you whisky enthusiasts, this is another chance for you to follow the latest news and information on Grant’s Whisky, as well as to share stories and experiences on all things whisky with your friends. I’m often asked where the idea for our famous triangular bottle came from. I have heard many different stories but the one below is my personal favourite. How much barley and wheat is there in a bottle of Grant’s? Following on from my post a few weeks ago on the adventures of Mister ‘G’ (which stirred up quite a bit of interesting conversation, to say the least! ), I thought I would share the rest of the 1960s print adverts with you. The best thing about working in a distillery is that no matter which cupboard I open, I am likely to find a bottle of whisky. A new Grant’s whisky website! I’m in Paris at the moment to meet with a few journalists at our Charles De Gaulle shop and whilst working in my hotel room last night, I started wondering about where to go for a drink. Today, I would like to make you aware of a competition that’s being held for a second year in the United States. Grant’s Real DIY Stories offers do it yourself enthusiasts the chance to win a home entertaining makeover worth $10,000. I met with Mark Gillespie from the world-famous WhiskyCast, while on a short visit to Philadelphia a couple of weeks ago. Now in its sixth year, the internet’s best whisky podcast comes to life a few miles outside Philly in ‘the charming yet regrettably dry town of Haddonfield’, as Mark so eloquently puts it…. Mark Dermul, Belgian whisky blogger, launches a mini-series of 5 videos in which he explores independent bottlings of Auchentoshan. First up is the Auchentoshan 18 Year Old from The Maltman. Enjoy! You are currently browsing the WhiskyIntelligence.com blog archives for February, 2013.